Plan your projects quickly with the new Project Planner (Advanced) template. Easy to use. Plan your projects in few minutes. All within Microsoft Excel. No programming used. A task begins the day after its predecessors have ended. For detailed instructions on how to use the Excel Template, please visit the support page. It will automatically create the schedule as seen below in the Gantt chart below. Though the template will create schedule automatically, you can still control the schedule in many ways. The template accommodates common practical business scenarios by providing options to handle the following resource availability constraints. Instant access to resource utilization info. and Cost. 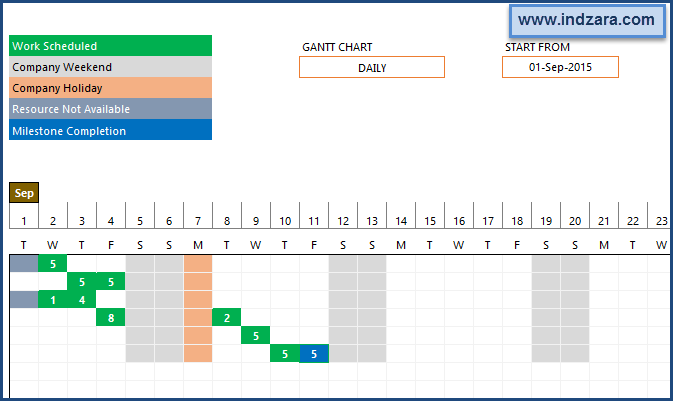 Customizable Gantt charts (daily/weekly/monthly) and any start date. Each task can have up to 2 predecessors. A task begins the day after its predecessors end. Very good template! easy to customize and to set. File is fast even in a network environment. Thank you very much! I looked for Excel based templates for some time and found this one. This tool is really helping me schedule several projects and allows me to see how they all line up. Thank you so much. I was thinking of developing a template to automate the planning process. I had a just brief idea of what I want, and I knew it will be a painful and long process. I was browsing the internet just to find an idea. And you know what? I found Indzara Planner Template, downloaded the basic version, tested, and it does everything that I want. Then I have purchased Project Planer advanced version, and don't regret that decision. It saved me at least a week of work to design something that need to be tested before use. What can I say: It's excellent spreadsheet for automation of projects. Very easy to add the tasks, assign to the resource, and if you do anything wrong, it will tell you. No macros used, which is a great advantage (as they mostly cause the excel app crashing), just formulas.